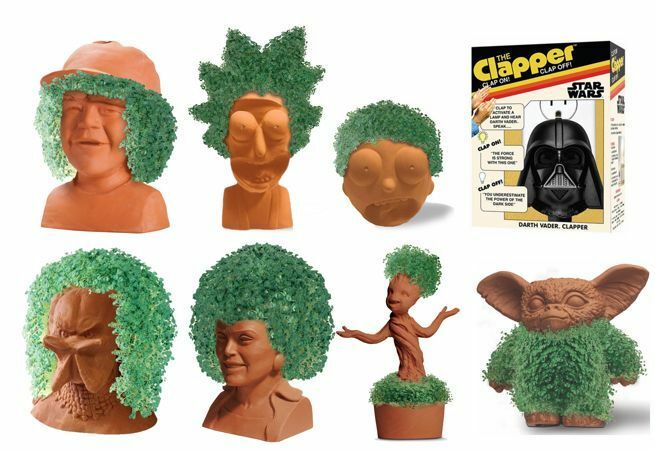 Back in February, toy maker NECA announced their acquisition of the companies behind the iconic '80s brands Chia Pet and Clapper. It wasn't long before NECA revealed their plans to blend these retro products with popular fandoms like Marvel, Star Wars, Rick and Morty, Stranger Things, Ghostbusters, and The Golden Girls. Especially The Golden Girls. If you're thinking that these would make for some very fun Christmas gifts (particularly with fans that are old enough to remember the Chia Pet and Clapper jingles) then we have some very good news. The first wave of Chia Pets are available to pre-order here for $19.99 each with shipping slated for November. A Darth Vader Star Wars Clapper is available to pre-order here for $29.99 with shipping also expected in November. At the time of writing, the Chia Pet collection includes both Rick and Morty, Gremlins Gizmo (good luck with watering it), Predator, Ghostbusters Slimer, Deadpool, E.T., all four of The Golden Girls, Guardians of the Galaxy Groot (2 versions), Stranger Things Dustin, and Care Bears Good Luck Bear. The Star Wars Darth Vader Clapper is available in both classic and modern packaging, and is activated with the same clapping action as the original. However, when you clap on and clap off, Darth Vader will say one of his classic quotes. Can Alexa do that? I think not. There has been quite a bit of buzz surrounding these products since the initial announcement, so it would be a good idea to reserve them as early as possible to ensure that you get them in time for the holidays. We wouldn't be surprised to see sell outs on some of these.